In October 2001 Andrey Lappa led a weeklong workshop at Moksha Yoga that truly inspired me and catapulted my practice to new heights. After my first conversation with him, even before class started, I intuitively knew that I was going to study with him beyond the one-week period. As the week went on, my feelings were only confirmed and my aspiration to travel to Kiev, Ukraine, and study with Andrey grew. Andrey's Power of Spirit and self-developed style of asana intrigued most yogis in the workshop, inspired a considerable number, but seemed to overwhelm the majority. By the middle of the week, however, there was a small group of us that was motivated enough to follow him halfway around the globe. Before we knew it, we were making plans for a six-week program with Andrey in Kiev, and I was at the Ukrainian consulate getting visa applications. Daren Friesen, Jim Bennitt, Anna Peters and I were among the seven going to Kiev who decided to spend New Year's Eve with Andrey in Crimea--a short holiday break before the intense training began. The others would meet us in Kiev in January. As our flight from Frankfurt, Germany landed in Kiev (Kyiv in Ukrainian) on December 25th, Jim was faced with a dilemma. He had not applied for a visa in advance, hoping he could get one at customs… it didn't work. So Jim was on the first flight back to Frankfurt--to be tempted with beer and sausages--while the rest of us met up with Andrey, who was waiting for us at the gate. From the airport we headed to a restaurant for our first Ukrainian meal. Although vegetarian entrees are fairly limited in the Ukraine, we enjoyed many vegetable side dishes such as potato pancakes, which are popular there. That first night we ordered grilled eggplant in a tomato sauce and cauliflower with cheese sauce. For dessert it was steamed dumplings stuffed with cherries with a dash of sour cream. We loved everything! While we ate, we were serenaded by flute-playing musicians dressed in traditional Ukrainian warrior costumes. A few days after we had settled into the apartment Andrey had set up for us, we were off to Crimea (the peninsula that juts from the southern part of Ukraine into the Black Sea and the Sea of Azo). There we witnessed the most amazing ruins of an ancient city built by the Greeks in the 4th century and Spanish forts dating back to the 6th century. Andrey took us on a highly memorable hike through the snow-bleached, mountainous forests bordering the Black Sea. The scenery and the hike were breathtaking. The damp weather didn't seem to sway the New Year's celebration, as a huge bonfire and fireworks lit up the sky to welcome in 2002. A few days later we were on a train heading back to Kiev to meet Jim, who had finally obtained a visa after contending with many obstacles and language barriers. Lourdes Paredes and Carmen Aguilara were going to be flying in the following day. As we came together, it all started to become more real to me; a new portion of the journey was unfolding. And we all had our moments as we traveled with Andrey to Russia for workshops in Moscow and St. Petersburg. I felt very fortunate to be experiencing all of these remarkable places, so rich in culture, art and fascinating history. From being enveloped by frescos of ancient cathedrals and absorbing as much art as possible at the Hermitage Museum, to having an after-class chat over tea with some local yogis in Moscow, the experiences seem limitless as I try to condense them into one article. Through all the disagreements, misunderstandings and occasions of frustration within ourselves and among one another, Andrey was steadfast in keeping us as one. He was much more than our yoga teacher for those six weeks, and as busy as his life is, for him to take as much time as he did for us was above and beyond… Even to the very end, when we were preparing for a workshop in Egypt, he was determined to have us all there to have a grand finale that would be unforgettable. Unfortunately, Carmen returned to the U.S. before our travels in Russia, and Lourdes couldn't make the Egypt workshop due to prior engagements. 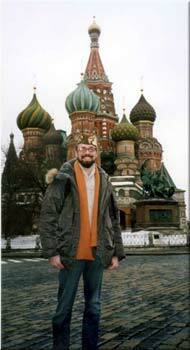 Mark Klemmen, however, flew from Chicago to join us in Kiev a few days before we left for a week in Egypt, and an unforgettable trip it was. Just being in temperatures over 1 degree Celsius (34 degrees Fahrenheit) was energizing, as we practiced asana every morning surrounded by the scent of exotic flowers and the crashing sounds of the Red Sea…not to mention the humongous breakfast buffet that the resort offered. The rocky desert is absolutely mystical, and a spiritual vibration permeates the air. 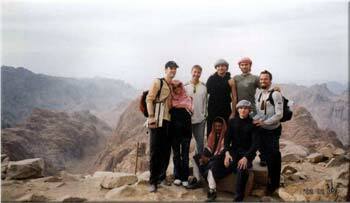 It was all quite enchanting, even our heated debates with taxi drivers and camel guides up to Mt. Sinai. The bargaining game, I found, can sometimes get rather tiresome; I know now why price tags were invented! Sherad, the owner of the local teashop, was probably the toughest to talk down just because we were always hanging out in his shop. One day we chartered a boat and went scuba diving and snorkeling. At dusk we all met out on the beach for the Dance of Shiva. We all had a magical hike up to the peak of Mt. Sinai, where Daren and I camped out for the night with the local Bedouins in order to witness the magnificent sunrise the next morning. The others made a day trip to Cairo, which almost turned into a two-day trip when the tire blew out on the way back to the resort. After Egypt, Jim, Daren, Anna and Mark spent their last few days in Kiev, seeing the sights they had missed and practicing their last few sessions of Universal Style Yoga (until May anyway, when Andrey will be back in Chicago). I decided to stay in Kiev for another five weeks to continue my studying, which is a whole other article in itself. I'm still absorbing and integrating, as I'm sure everyone else is. And as that integration takes place, I'm reminded of all the life lessons and humorous details that had to be left out of this article to protect the innocent (or not so innocent). They will be with me for life, and my gratitude for the opportunity is endless. James Tennant is a teacher at Moksha Yoga Center, Lakeview.